Men’s and women’s lifestyle brand Joe Browns has recorded over £1.25 million sales in its first 7 months of trading in its flagship retail store. The 4,000 sq. ft. store was opened in Meadowhall Shopping Centre in Sheffield in November 2017 as part of the centre’s £60 million regeneration project. Simon Brown, MD and founder of Joe Browns,said:“Our first store very quickly passed the £1.25m sales mark and over 25,000 customers have now made a purchase. “Sales have far exceeded our expectations, it is significantly driving more regional traffic to our website and we are now flooded with demand from customers for more stores. 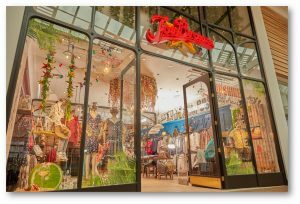 Gross profit has grown over 30% in the last 2 years for Joe Browns, with the company predicting further growth this year, despite the store investment. They plan to further bolster sales with extended ranges and new product categories. Mr Brown added: “We are pleased that our mens wear range has out performed the space, justifying us putting it in a prominent area of the store and the fresh new looks we create in our window displays turn heads and keep customers coming back.